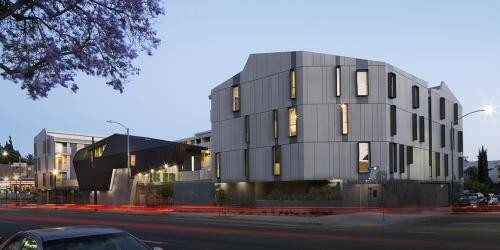 Architecture News from M-Rad Inc. The Green St. project by M-Rad Inc. is nearing completion. 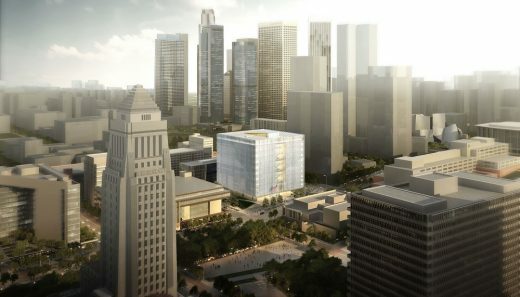 Some of the heaviest hitters in the cannabis industry will soon be moving into their new home in downtown Los Angeles. MOTA will occupy an entire floor of the Green St. building – a seven-story, 67,000-square-foot cannabis hub in downtown LA designed by M-Rad Inc. Once Green St. is complete, it will be the largest private members space dedicated to cannabis in the country. MOTA (Spanish slang term for marijuana and also known as “Medicine Of The Angels”) will occupy the entire fourth floor and will be used as a members lounge and spa. This floor will also include luxurious relaxation rooms, an entertainment area, privacy pods, a cafe supported by a world-class restaurant group with coffee by Mary Joe, a library, and secret meeting space all designed by M-Rad. The space will also feature custom M-Rad furniture currently in fabrication in downtown Los Angeles and Bali. M-Rad designed the space to encourage an inviting, playful, and relaxing experience with modern elements and a heavy influence of hospitality. 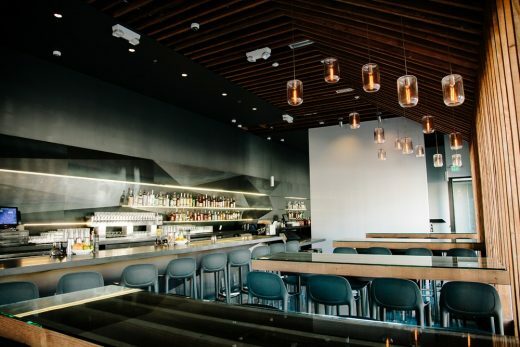 This space will act as a model for future cannabis hospitality spaces. Each floor of the Green St. building is specifically designed for the cannabis connoisseur in mind. 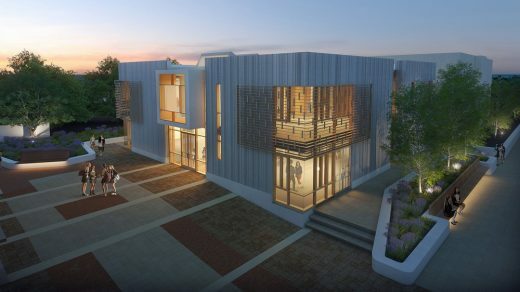 The building itself will host several cannabis-related programs such as cultural activities and gastronomic experiences ensuring the space is tapping all senses. Some of the partners affiliated with the project are prolific investor Gary Vaynerchuk, who is a 50% stakeholder in Green Street Agency, and Vicente Sederberg LLC dubbed The Marijuana Law Firm. The project is slated to be completed in Q1 of 2019. 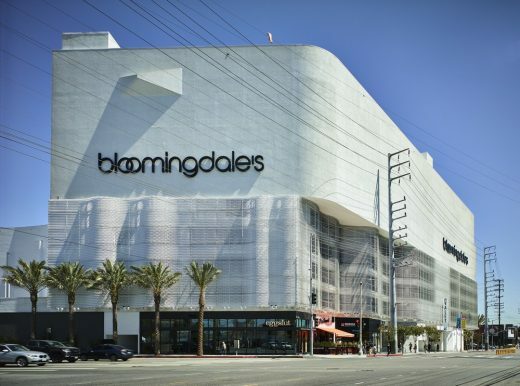 Beverly Center Renewal – The Mall of the Stars, 8500 Beverly Boulevard, edge of Beverly Hills and West Hollywood, L.A.
Construction of a new pavilion for Wilshire Boulevard Temple, Los Angeles’ oldest Jewish congregation, to be a multi-use cultural, religious and event space directly adjacent to the Temple’s historic sanctuary. Within a very limited space, Yojisan brings a surreal revolution to a city of tradition while staying refreshingly whimsical and modern. 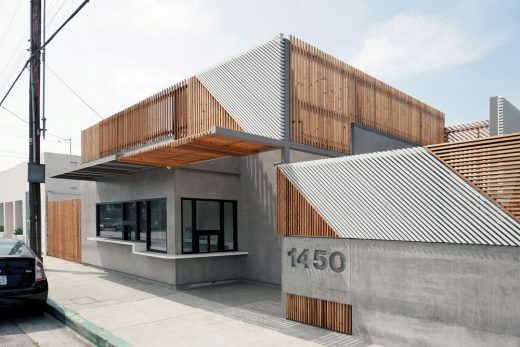 Hide Out in Little Osaka, L.A.
New House in Venice, L.A.
As its name suggests, the Flip Flop House plays with a sense of duality on multiple design levels. 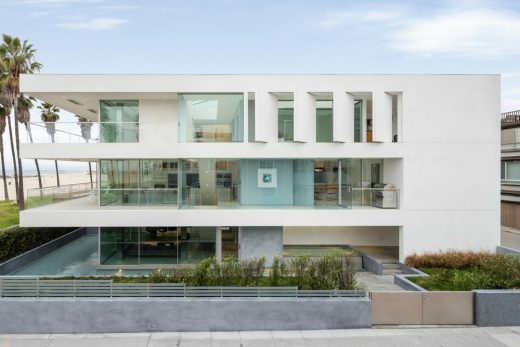 Acting as an architectural chameleon, the dynamic house is malleable to the clients’ desire to both display their art collection and embrace the sweeping vistas of Venice beach. Fifteen pop-up shelters are due to open, one in each city council district, funded through Mayor Eric Garcetti’s “A Bridge Home” program. 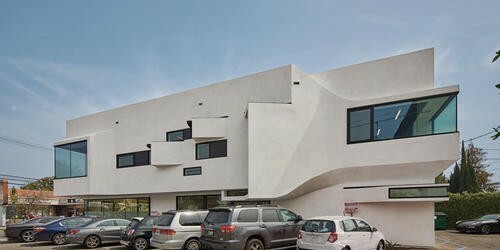 The El Pueblo emergency homeless shelter opened last month in downtown Los Angeles, on a city-owned parking lot near Union Station. The shelter building design by Gensler is composed of three trailers arranged around a central outdoor deck. 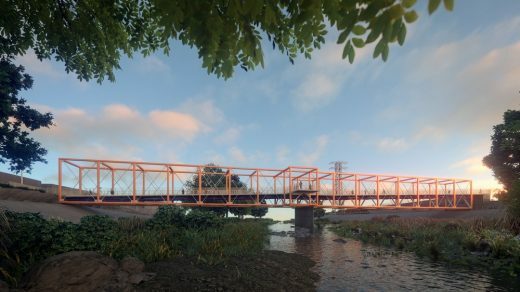 The initiative was launched in April 2018: it will implement recommendations outlined in a December 2017 report by the nonprofit Urban Land Institute (ULI) to fast-track the construction of “bridge” housing. The new homes will provide immediate help for homeless individuals until more permanent options become available. Over 25,000 people are now living on the streets of Los Angeles. 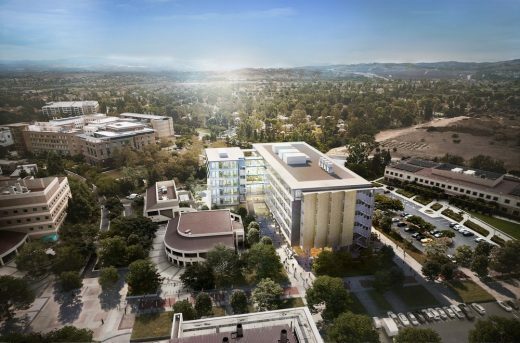 The teams participated in an intensive half-day charrette to create models for 50-, 100-, and 150-bed facilities that could be easily adapted to a number of sites. 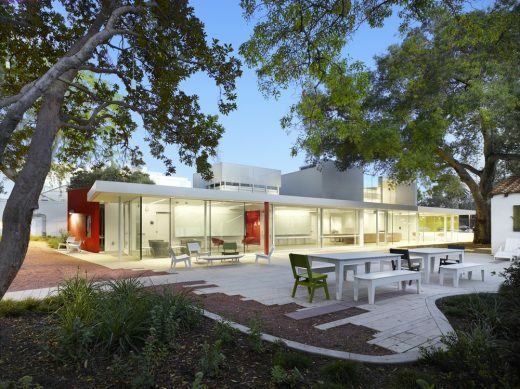 The community center building contrasts porous public spaces extending into the park with more introverted and cloistered areas for concentrated study. 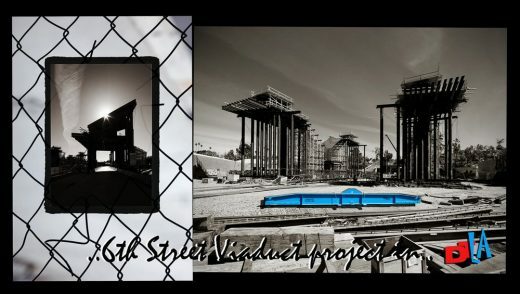 The L-shaped building will be organized as three distinct volumes: a “Jewel Box” glass-and-concrete tower; a glass and precast concrete “Lab Bar” to house a variety of highly adaptable laboratories; and a transparent, glass-wrapped connector dubbed the “Community Hub”. A preliminary study model made from a square pile of note paper, describes a concept for a tower which is not quite a regular box, nor a clear, spatial departure from the regular box. 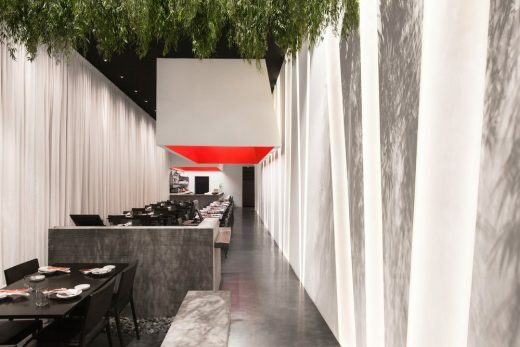 This new restaurant is located in a new modern building so first and foremost that informed the design as we strove to create a clean, almost minimal feel with playful bursts of vibrant color. Rancho Cienega Sports Complex Building L.A. 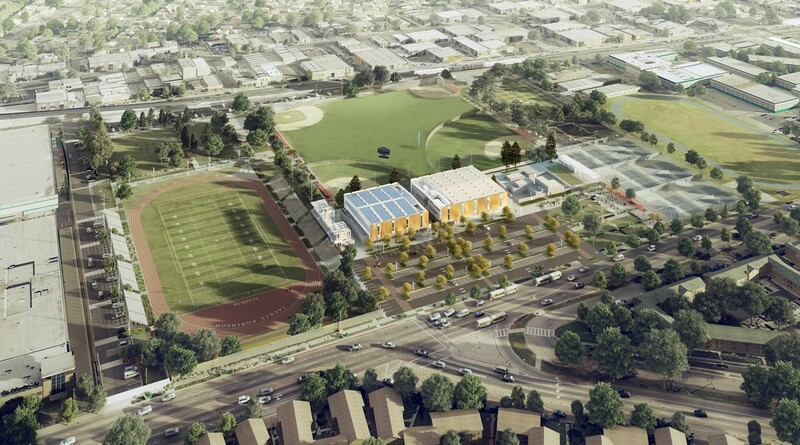 The new masterplan will update and expand the legendary sports center’s existing facilities and green space. Current housing in our congested urban centers has come to prioritize function over consideration for a human’s emotional relationship with the living and natural environment. This innovative residential project demonstrates the core design philosophy of this up-and-coming Chinese architecture studio. 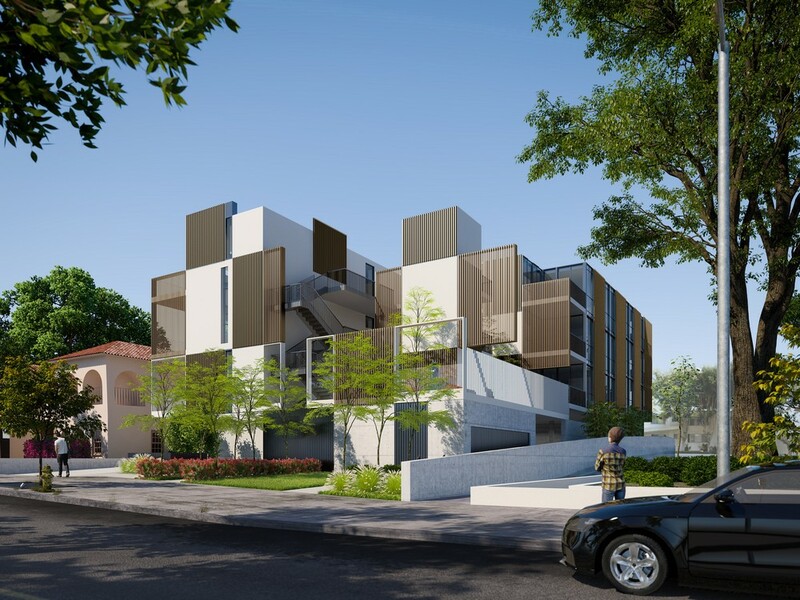 Renderings for a four-story condominium planned a block south of Sunset Boulevard in West Hollywood. Los Angeles building pictures ranging from The Academy Egg designed by Renzo Piano to ‘The Aven’, a 39-story apartment complex in the South Park area of downtown LA, and Banc of California Soccer stadium in Exposition Park. 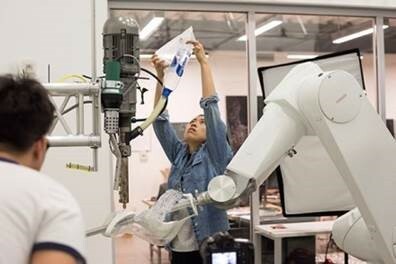 SCI-Arc’s B.Arch, M.Arch 1, M. Arch 2 and Master of Science degree programs have been designated as an approved field of study within the U.S. government’s official STEM fields list in Architectural and Building Sciences/Technology. On February 6, the Los Angeles City Council adopted a resolution targeting drastic cuts to greenhouse gas emissions from commercial and residential buildings. The measure gives L.A.’s Building and Safety Department and the Department of Water and Power (DWP) 90 days to recommend methods for reducing reliance on natural gas and shifting toward electricity from clean sources for heating, water heating, and cooking; and requires DWP to set ambitious goals for building electrification in 2028 and 2038. 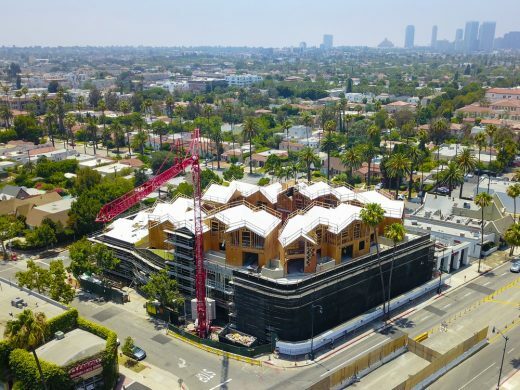 The targets are in line with mayor Eric Garcetti’s aggressive sustainability plan, which aims to reduce greenhouse gas emissions by 60% before 2035. 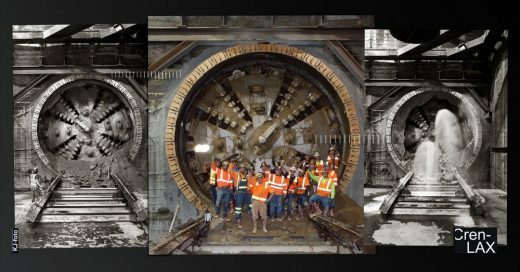 Their vision for L.A. is to be fossil fuel-free: the city needs building electrification to make this vision a reality. Currently, the L.A. region burns more fossil fuels in its buildings than in its power plants. A study in texture, transparency and materiality, this corner walk-up cafe aims to inspire and enhance the area’s rare pedestrian culture. 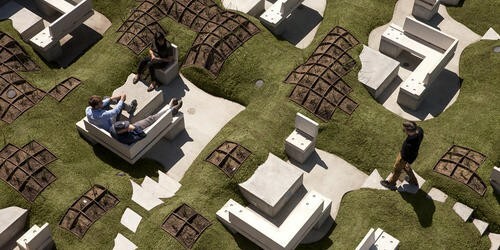 The main focus of the design is to create a calm, inviting public space that directly engages its frenetic urban setting. An open-air complex of apartments, condominiums, movie theaters, restaurants and shops that promises to enliven a city block that has been mostly dead for half a century for Related Co. The Grand will have a mix of shops and restaurants spread among a series of landscaped open terraces, along with an approximately 450-seat cinema complex on the east side above Olive Street. There will be a 20-story Equinox hotel with 314 rooms and a 39-story residential tower with 113 condos and 323 apartments. The new building allos Gehry to unlock a trick he baked into his Disney Hall design — its metal surface were carefully arranged to receive light projections from across the street. Live Los Angeles Philharmonic concerts can be shown on multiple walls of Disney Hall. 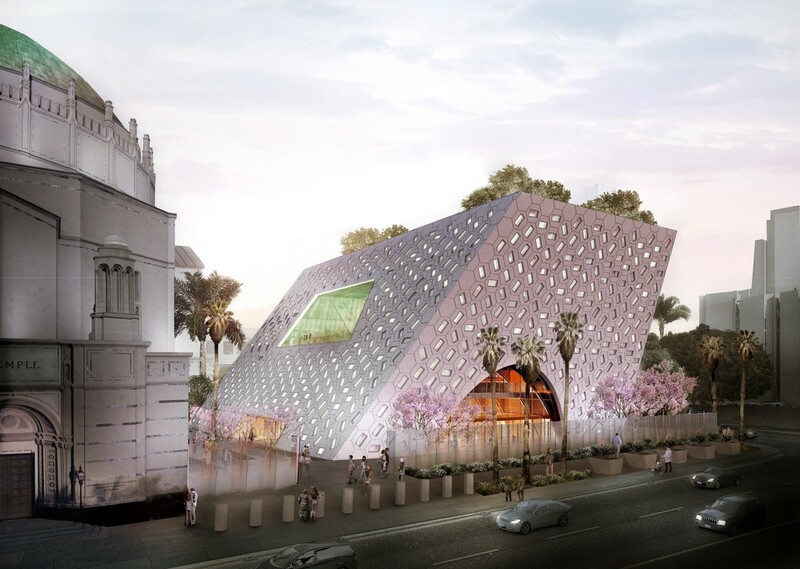 The project will help underline the location as L.A.’s cultural and civic district with a third component being the Broad’s contemporary art museum. Parallax Architects and The Archer School for Girls are pleased to unveil “Archer Forward,” a bold and elegant Campus Master Plan proposed for the school’s historic campus. 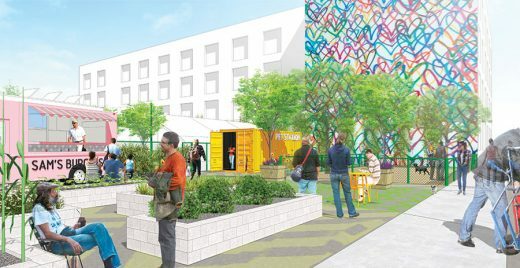 The city of Los Angeles Board of Public Works has approved the Bureau of Engineering’s selection of WSP USA to provide planning, design and remediation consulting services in connection with the planned Taylor Yard G2 Parcel Park Project, a major component of the city’s ambitious plan to revitalize the Los Angeles River. The site will require soil remediation before construction can start. WSP will produce an implementation plan and pre-design report that includes a site remediation strategy and concept designs for phased development (interim and long term uses). 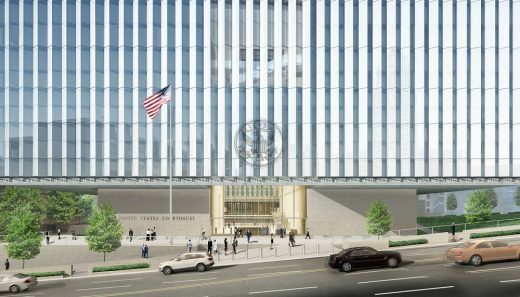 A phased approach of the project is intended to address required remediation as funding is available, while allowing more immediate public use of portions of the site. The project includes a robust stakeholder engagement process to gather input from the surrounding neighborhoods about how this new park could serve them. This LA building is located in the heart of the Old Bank District of Downtown. Capitalizing on the tension between historical and contemporary architecture, the project is part adaptive re-use and part new construction. It is devoted to engage the public with the most important ideas of our time through the art of Los Angeles. ‘Clocks and Clouds: The Architecture of Escher GuneWardena’ is a survey of the firm founded in Los Angeles by Frank Escher and Ravi GuneWardena, on show at the The Art, Design, & Architecture Museum. It highlights Escher GuneWardena’s engagement with art, craft, and architecture. It presents the full scope of their architectural practice, collaborations with artists, and explorations in architectural history. 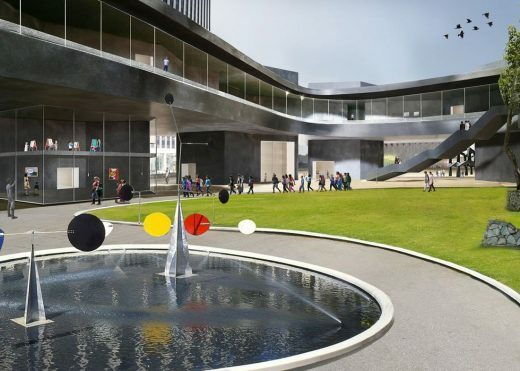 After looking at sites in Chicago and San Francisco the art collection and archives of film director George Lucas has at last found a home, in Exposition Park. Hundreds of unique pieces assembled into a self-organizing form. Similar to the way a tailor crafts a suit of clothing, the aluminum skin was digitally rolled and unrolled, then cut by a CNC machine and finally attached to a complex metal substructure made of straight lines, leaving a space between the white aluminum panels of exactly one and three/fourth inches. elebrating the 50th anniversary of the sister-city partnership between Berlin and Los Angeles, Berlin/Los Angeles: Space for Music on view at the Getty Research Institute from April 25 through July 30, 2017 explores two iconic buildings: Berlin Philharmonic (1963) by German architect Hans Scharoun, and Walt Disney Concert Hall building (2003) by famous LA architect Frank Gehry. 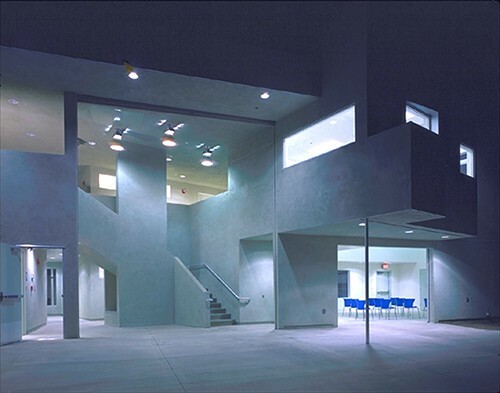 In 2007, L.A. architecture saw a major changing of the guard as architect Hitoshi Abe from Sendai, Japan, became chair of the department of architecture and urban design at UCLA and Shanghai-based architect Qingyun Ma took over as dean of the USC School of Architecture, reports the LA Times. Now both men are moving on from those posts: Abe stepped down last year, while Ma’s final day in the job is June 30. (Both will retain professorships at their respective schools.) There has sometimes been tension in their relationship, and either wanted to hold the Q&A on the other’s campus. The 633,000-sqft facility “contains 24 courtrooms and 32 judges’ chambers. 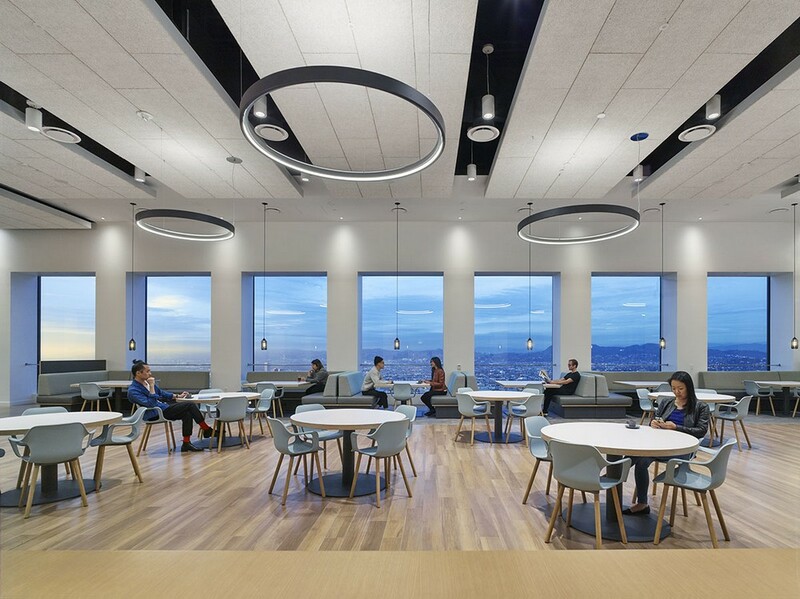 The building is designed to achieve LEED® Platinum certification, with sustainable features such as a serrated facade that maximizes views, while reducing solar heat gain by nearly 50 percent. 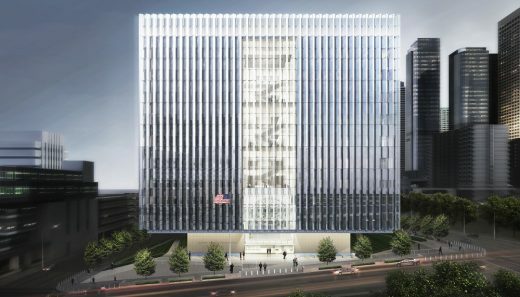 SOM’s design for the courthouse optimizes workflow and promotes efficient operations and maintenance”. M-Rad‘s newest project is located behind the infamous Bunker Hill site next to the Angel’s Flight vernacular in the heart of downtown, Los Angeles. With the flourishing densification of downtown, we have seen a lack of public green space as well as increased opportunities to develop mixed use buildings. The architectural concept behind the Bunker Hill project aims to create a place for the community to gather in an environment inspired by nature while maximizing the potential use of housing, creative office, research facilities, retail and hospitality spaces. The tower will be elevated above the existing greenscape to highlight both the history and importance of Bunker Hill while connecting it to the streetscape of Los Angeles, blurring the line between urban landscape and nature. Since 2003, design retailer and curator David Alhadeff has built a reputation with The Future Perfect, his design showroom and gallery that started in Brooklyn. 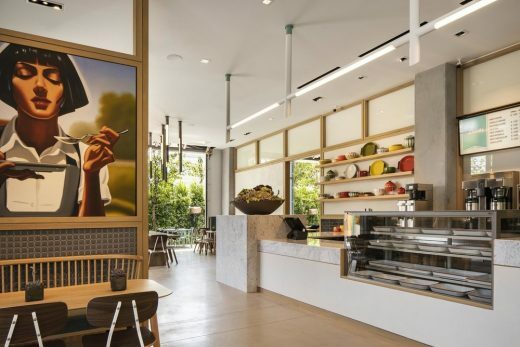 The Southern California store occupies an entire private home in the West Hollywood Hills. 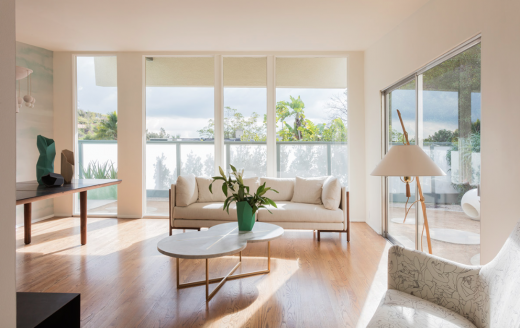 Dubbed “Casa Perfect,” the Modernist villa was designed by architect David Hyun and built in 1957. Luxury LA property set within a plot containing mature trees. SCI-Arc is pleased to present José Oubrerie’s Chapel of Mosquitoes architecture and paintings, opening February 3, 2017 in the SCI-Arc Library. Oubrerie’s Chapel of Mosquitoes synthesizes the opposite spatial investigations of two of the architect’s most significant works: the 1986 French Cultural Center in Damascus and the 1992 Miller House in Lexington, Kentucky. The Chapel, planned for a site in upstate New York, becomes a contraction of these two projects yet retains attributes of both. Is the home a place for both work and play? A place for entertainment? A destination for travel? A place for family, friends and beyond to gather? Does a home shield you from the elements or bring you closer to them? Who does the home serve? A single individual or large family? Who does it serve today and in the future? This three-story contempoorary property emerges above the canopy of trees that surround it. A flexible University Campus building for a leading Scientists Think Tank, Board of Trustees and various other activities. 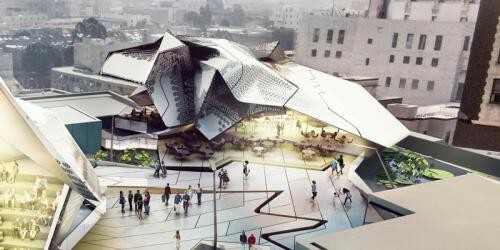 Images revealed for the new Los Angeles County Museum of Art building expansion. The proposed Ocean Avenue Project is a hotel and museum campus that merges world-class urban design with historic preservation to create an important cultural anchor for the community. 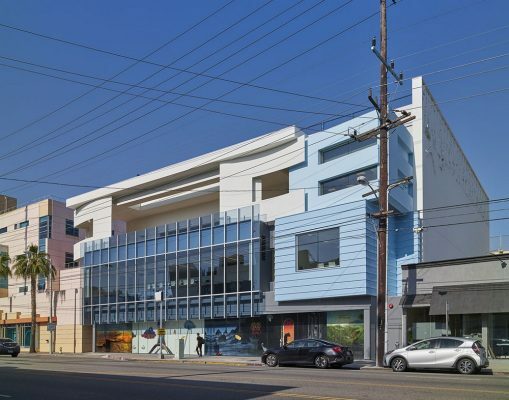 Located on the corner of Ocean Avenue and Santa Monica Boulevard in the heart of downtown, the project is being proposed by M. David Paul Associates and Worthe Real Estate Group, both with strong roots and involvement in Santa Monica. 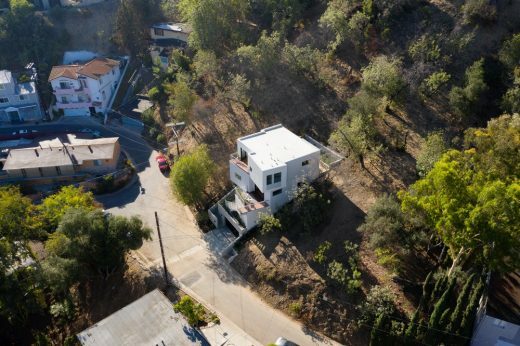 Nakahouse is an abstract remodel of a 1960’s hillside home located on a West facing ridge in the Hollywood Hills, just below the Hollywood sign. To the South and West are views of the Beechwood Canyon; to the East is a protected natural ravine, with a view of Griffith Park Observatory in the distance. Submission of a proposal by this US-Dutch design team for the Master Plan development of Los Angeles’ Union Station. 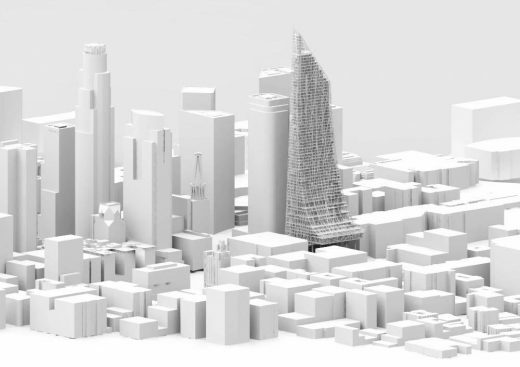 Ben van Berkel and Jonathan Cohn presented their conceptual rendering set in the year 2050, showing this major L.A. building as a multi-modal transit hub with a mix of uses, new development and outdoor spaces. This 3,000 square foot three story residence is meticulously designed to make the very most of its privileged ocean front setting. 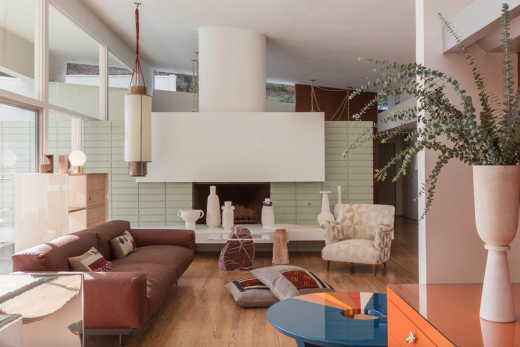 The home’s interiors combine a collection of fine materials and rich colors to define, animate and sculpt the spaces. 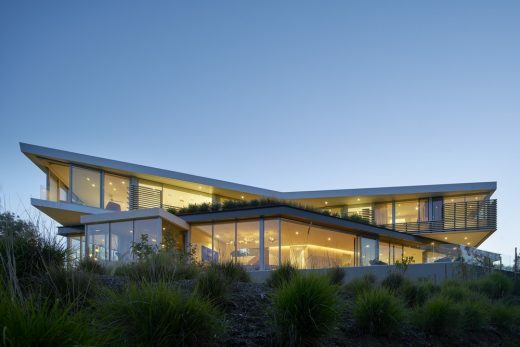 This project exists on a massive property in the Malibu hills with unique topography and panoramic views looking out to a nearby mountain range, a valley, and the Pacific Ocean with islands in the distance.